*Summer SPECIAL* New condo with try us Special Rate Beach Service for 4!!! 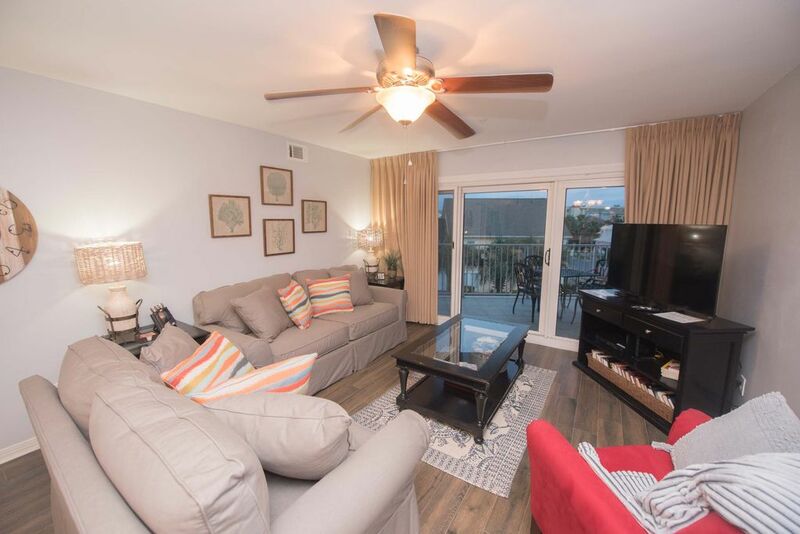 Maravilla Resort Community in Destin, Florida is a gated community that offers a beautiful large private beach, tennis courts, two swimming pools, club house facilities, barbecue grills and a fitness center. The resort's private beach is 2.5 acres of sugar white sand along the beautiful Emerald Coast of the Gulf of Mexico in Destin, Florida. This condo is located in Building one on the 3rd floor. Condo has been newly remodeled! New flooring, paint, decor and furniture. Beach service for umbrellas and chairs is included with all rentals 4 Chairs and 2 Umbrellas are included with this rental! Beach Service for 4 would cost over $350 per week! There is a volley ball court set up at the beach for the enjoyment of owners and guest. The beach service also rents kayaks and boogie boards. The gulf front pool is a favorite of Maravilla visitors. The club house pool and the hot tub are heated during cooler weather. All of Beach Condos in Destin’s Maravilla rentals are pet friendly. Tennis courts and the fitness center offer the guest hours of great physical fitness while enjoying their time at Maravilla Resort. The clubhouse, suitable for family functions, is equipped with a kitchen and a large screen TV, and can be reserved by guests of Maravilla. Guest utilize the clubhouse for wedding receptions and family reunions while staying at Maravilla. Condo was nicely updated & tastefully decorated. Upon arrival thing Appeared Mostly clean (some dog hair and surface dust on furniture)& in working order. Kitchen is nicely stocked, we were able to prepare a few dinners in the condo. Plenty of bath towels. family of 5 &there was plenty of toilet paper &paper towels for the week. Beds were moderately comfortable, linens had some dog hair on them, this didn’t bother us,we knew we were renting a dog friendly condo. Issues we ran into: tv in the bunk room to work, the screen stayed black. Screen door in need of repair, Strange brown splatter on the bedskirt in the master bedroom. dust, old dog toys &lots of dog hair under beds. Cleaning crew should be doing a more thorough cleaning esp. since you allow dogs. Need a small chest of drawers in bunk room- no where to put clothes. Chair set up: it is awesome this condo offers 2 setups, most only provide 1. In the past I have stayed at the Maravilla numerous times and have found the “chair guys” to be very friendly &on top of things. This week we were not so lucky. The first few days we went out we gave the guy our room number &name. He sent us straight out from their chair: We asked if we could reserve the same spot for the next day &they said no, they were first come first serve. One day we didn’t go to the beach. The next day we were told they were out of 4 chair setups. He told us to wait while they set something up for us. He then seated someone. Then he started walking back &before he got back to where we were standing he approached a group of teen girls &got them seated which I thought was rude to make us wait longer, we had 3 kids with us who were eager to get to the beach. Our last day we made sure we came down early so they didn’t run out again and asked if we could have the same set up straight out we had a few days ago. We were told no because it was in the owners section. Made no sense because we had used it before. Then asked about another setup &told it was reserved (no one had their stuff set up there like it was being used, it had a little sign on it). Confusing when we were told it was first come first serve and could not reserve. This was all incredibly frustrating. We always generously tip them, this week we didn’t at all. Over all we really enjoyed our stay in unit 1310. It was a little chilly but the sun was out and the ocean was calm. We would recommend this unit to families with kids and dogs and would stay in this unit again. I am so glad that you enjoyed the condo and all of the upgrades. I wish that you had called about the cleaning issues while you were here and I would have sent our housekeeper back. This was a new housekeeper and her first day on the job after a military family evacuating from Tyndall Air Force Base with a very hairy pet had left from a 2 month stay. We have instructed her on being more thorough in her cleaning. The beach service is the same group that has been there for years but they also have new team members from time to time. I will pass your comments on to the management of the beach service so that they can address your concerns. Thank you for being our guests. Overall we enjoyed our stay at Maravilla Cottage 40. The house is located on a cul de sac. Backyard is private and dog friendly. House is about 1/2 mile from beach. We rented a golf cart during our stay and it was nice to drive that to the front of community and walk to beach. The big screen tvs were nice. An abundance of towels and wash cloths were provided for our week stay. The four star rating is due to the small shower in master bath and the floors were sandy when we arrived. However, all considering, we enjoyed the house and would stay there again. It was very clean and very roomie it met all of our expectations.Will definitely return. We had a really nice vacation at this Maravilla home. There were 6 of us and we felt that there was plenty of room and the home was nicely appointed. The beds were comfortable and the number of towels provided a plus. We cooked a lot and found that the kitchen and living room would get very hot compared to the rest of the house during this time, but we were able to set up fans to help make it cool enough for dinner. We had a little difficulty with the gas grill on the patio and even with lighters, we were unable to get it to ignite. The neighborhood was very nice and the location was convenient. We utilized the small fitness room most every day even though a few pieces of the equipment weren't operational. We also appreciated the beach toys provided in the garage; our kids enjoyed the boogie boards. We found the reservation process and communication leading up to our stay very helpful. Thank you for a great vacation. We loved our stay at our Cottage in Maravilla! This is our 6th year staying at the Maravilla community and love coming to spend our family and friends vacation here. This year was the best so far! A few showers but they quickly evaporated to great beach time with family and friends. The cottage was very roomy and comfortable for all our needs! Looking forward to returning next year for another great stay!